good to work on since it hogs less resources as compared to Nautilus. By default it is quite small and does provide a limited set of functionality , however it's functionality can be extended by using various plugins. Now by default thunar shows file name and associated icon , however i like viewing files and directory as detailed list so well i decided to change how it shows files and folder by clicking on (View as compact list) . 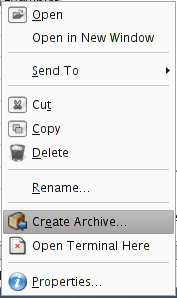 One of the plugin that impressed me was "Thunar archive plug-in" that allows one to extract file using the right click menu in Thunar as well as creating file using right click menu of mouse. 1. 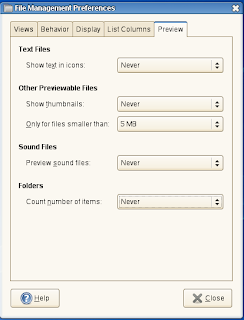 Turning off Thumbnails : - By changing setting to never you can turn off thumbnails of pictures that are shown by default in nautilus file manager this setting can speed up nautilus significantly if you have a slow system and directory you are browsing has a lot of high resolution images. 2. Turning of text in icons : - This is another setting that can be turned off , unnecessary resources are wasted in showing the content of text files as thumbnails . This can help speed up nautilus a bit. 3. Turning off count for number of Items : - Now this can speed up things a bit in nautilus since some resources are used in counting the number of items present in directory however it wont show any significant improvement on new machines or even on half descent machines. Try this only on very slow computers. 4. Turning off sound preview : - If yo have mpg123 or ogg321 installed nautilus provides a way of previewing sound files now this does consume some resources and hence can be switched off. AND BTW, MAC RIP OFF! I LOVE MAC SO MUCH!!!!!!!!!!!!!!!!!!!!!!!!!!!!!!!!!!!!!!!!!!!!!!!!!!!!!!!!!!!!!!!!!!!!!!!!!!!!!!!!!!!!!!!!!!!!!!!!!!!!!!!!!!!!!!!!!!!!!!!!!!!!!!!!!!!!!!!!!!!!!!!!!! finder is the worst thing on the mac, why emulate it? I tried FXCE for a bit because I'm generally fond of lightweight, snappy window managers. But Thunar seemed a bit... lacking. Specifically you can't use it to access network resources without first mounting them via some other method (some sort of fuse action... or through fstab... etc...) I think I'll be sticking with a file manager that's a bit more robust for the time being. Thunar could be sparse in features but since it is light-weight, they can extend it and still keep it efficient without repeating Nautilus mistakes. BTW, why don't you try changing Beagle with Tracker [http://www.gnome.org/projects/tracker/] it is much more efficient than Beagle (less than 10MB of RAM). BTW, this was done on Ubuntu Feisty but should work with any GNOME based distro. 1) Make sure that Nautilus doesn't respawn when you kill it. Goto Sessions applet and set it to normal. What these apps will handle is self explanatory. 4) Make sure you remove Thunar from starting in you GNOME session in the Sessions applet. 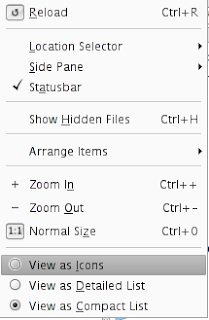 5) Add xfdesktop to your sessions. Set it to respawn if it dies. This way xfdesktop handles the desktop and it automatically uses Thunar for the file manager. All of the custom actions work on the desktop now! 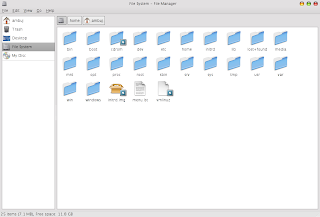 File Managers look pretty similar to me whether on Apple, Windows, or GNU/Linux. I understand about the need to be light on resource use at times, but I would like to hear some more about customization and functionality. The one manager that has been most successful for me is Xplorer2 (for Windows). Can Thunar (or Nautilus, or PCMan or . . . ) compare with the features and function of Xplorer2? I'm especially interested in two window interface. Eaglemode is a very interesting way to explore your filesystem. You should check it out if you are looking for alternatives to traditional drag and drop file managers.